Three companies have collaborated on a new water test cartridge and automated monitoring system. The increase of acute gastrointestinal illnesses (EPA estimates more than 4 million) has been predominantly attributed to public drinking water systems in the United States. This has driven the need to develop new microbiological test methods that are faster and easier to use than traditional methods. Currently, typical laboratory water vial testing samples can take up to two weeks of processing for final results of clean water that is free of harmful E.coli and Total Coliform bacteria contamination. A new turnkey single-use water test cartridge and automated monitoring system recently has been developed to reduce this process to within 2-18 hours, depending on the level of contamination. The water test cartridge incorporates over-molded rigid plastic and optical grade LSR (liquid silicone rubber) in a fully automated production process. The test cartridge leverages a 2-shot mold and subsequent robotic transfer into an integrated assembly cell to complete six processes outside of the molding area, and then put in a box ready to ship. The water test cartridge system is the result of a dedicated collaboration by Roembke Mfg. & Design, Inc. (Ossian, Ind. ), a leading designer and manufacturer of inserted flashless rubber molds; water sensor and monitoring company ENDETEC™ (Kingston, Ontario, CN); and injection molding machine manufacturer Engel Machinery North America (York, Pa.). ENDETEC’S TECTA™ automated microbiological testing system for E.coli monitoring features an instrument with built-in incubation, an optical system, integrated user interface with interpretive software, and a special test cartridge for the detection of E.coli and total coliforms. Key design elements in the cartridge included a plastic vial with a living hinge and cap, coupled with an optically clear LSR plug/nub at the bottom of the vial for testing the water via the optical system. Initial discussions between the entities focused on determining which materials could be used for the product and what process would most efficiently produce it. The materials had to be clear to see the fluid inside the cartridge and pass gamma sterilization processing, and there could be no inhibitors in the chosen plastic in order to get an optimal seal with the LSR. Lastly, the materials could not interfere with the microbiological growth that takes place during the test process. Given these parameters, the plastic selected was a modified polypropylene, and the LSR was an optically clear 1003 grade silicone. The materials were finalized by tweaking the thermoplastic process to figure out estimated cycles, temperatures of the mold, sealing, etc. The next vital decision in the early stages was whether to mold the materials separately and assemble or to overmold them. “This 2-shot overmolding process was quickly adopted since it allows new formulas to bond to different substrates, such as silicone and plastic, most cost-effectively,” explained Greg Roembke, president of Roembke Mfg. & Design. Additional focus was paid to the thermoplastic side to meet the challenging criteria of the required temperatures needed to achieve a good cycle time. This was also done to produce an effective seal that would not leak fluid between the plastic and LSR materials. ENDETEC worked on the seal design between the two materials and determined there could be no chemical bonding agent between them. Ultimately, the Roembke Mfg. & Design mold was a single drop cold deck with a standard LSR valve gate design featuring side injection versus back injection for the plastic. The final Engel machine was a standard two-component machine that incorporated the smallest diameter screw possible (12 mm) on the injection unit. The wide platen machine leveraged a special ejector pattern for the tool design centered behind each application for the thermoplastic and LSR. Dedicated servo valves were used on both ejection units with valve controls used for optimal speeds and pressures. The first stage of automation was also addressed in the prototyping by Engel, which enlisted Pro Systems (Churubusco, Ind. 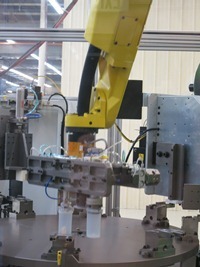 ), an automated machine systems builder for the plastics industry, to integrate the turnkey automation into the machine. The six-axis robotic system completed six processes outside of the molding area. This also included placing a water soluble pouch containing pre-measured amounts of growth media that support the enrichment of any target bacteria present in the sample for each water test cartridge. For more detailed information on Roembke Mfg. & Design, Inc., visit www.roembke.com.